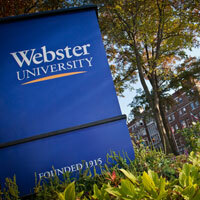 The Higher Learning Commission (HLC) has reaffirmed accreditation of Webster University. Webster has been accredited by HLC continuously since 1925, and this accreditation applies to every Webster campus and location throughout the world and online. The reaffirmation concludes the 10-year cycle under the HLC’s Open Pathway program, a process that includes self-evaluation steps, compliance reports, collection of evidence, quality improvement initiatives, and interim visits leading up to a peer review team’s comprehensive evaluation and visit, which was conducted at the Webster Groves campus in spring 2018. As part of its upcoming visit to review Webster University’s ongoing fulfillment of Higher Learning Commission's criteria for accreditation, the peer review team will hold three separate open forums with the Webster community based on HLC’s five criteria for accreditation. The peer review team will seek input from faculty, staff and students, who are encouraged to attend those forums which relate to their activities at Webster. Webster's working group for the Reaffirmation of Accreditation comprehensive visit by the Higher Learning Commission will host two pre-visit forums to help inform and prepare faculty and staff for what to expect during the HLC peer review team's March visit to the Webster Groves campus. Colleagues will provide an overview of the process, what to expect from the visit, its importance, and how each member of our community can help. Join members of the working group Feb. 20 or March 7, either in Browning Hall or via WebEx. On Tuesday, Jan. 16, Webster University is administering the Higher Learning Commission’s Student Opinion Survey. The HLC’s survey was sent via email to all students who were enrolled in Fall 2017 but have not yet graduated. The survey is voluntary and anonymous. Students’ comments about their experiences at Webster are an important part of the reaccreditation process. Webster University is seeking comments from the public about the University in preparation for its periodic evaluation by its regional accrediting agency, the Higher Learning Commission. Webster University has been accredited by HLC since 1925. A peer review team will review the institution’s ongoing fulfillment of HLC’s Criteria for Accreditation during a site visit in March 2017. The public is invited to submit comments regarding Webster directly to the HLC. In preparation for the next HLC comprehensive visit, a working group is gathering evidence to demonstrate that Webster meets the five criteria for accreditation and developing a first draft of the assurance argument. This spring, the working group is offering "HLC Focus Sessions" on key areas of accreditation. The sessions are designed to provide information, but also to solicit information and examples that support our assurance argument. Please plan to attend sessions relevant to your area. In preparation for Webster University’s next comprehensive visit from the HLC in March 2018, a working group that is gathering evidence for the five criteria on accreditation will offer audience-specific "HLC Focus Sessions" in March and April to provide information and solicit input from faculty and staff. Webster University’s Reaffirmation of Accreditation comprehensive visits by Higher Learning Commission (HLC) reviewers will occur in Academic Year 2017-18. In preparation, a working group has begun to assemble documentation in support of reaffirmation (in HLC’s language, the Evidence File). In Fall 2016, small groups of experts will begin to review outlines of how Webster meets the five Criteria for Accreditation and the evidence collected. Learn more about the steps in this process and the members of the working group.